The name Sliabh an Iolair is recorded as the official Irish name of an electoral division. The hill is also known as Croaghane [OSNB]. Mount Eagle is the second highest hill in the W Limerick/N Kerry area and the 793rd highest in Ireland. I must confess to having had a negative impression of the Mullaghareirks - one of sprawling square miles of forestry blanketing drab hills, neglected and unloved. So it was a pleasant surprise to make a first visit and find an area somewhat less grim than expected. There's good road that crosses a saddle with neighboring Ballinard, and here you will find the gate leading up to a windfarm at R0950 1110 A (it was open when we visited - but there were workers fiddling around with a turbine). 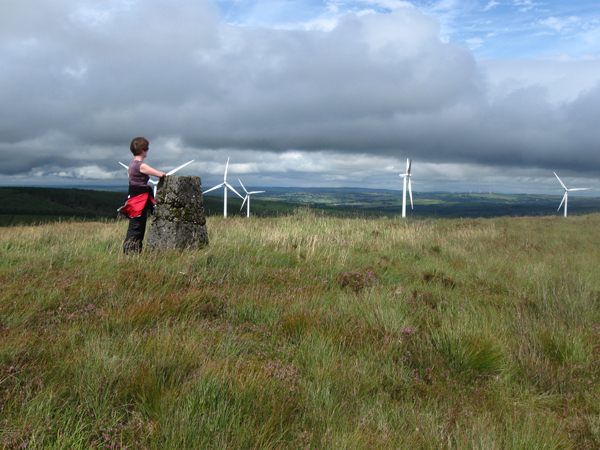 We walked up the road, and turned right, passing a number of windmills. As the road turned right downhill, we went left, clambering up a steep peaty bank. Once over the fence, it was only a few minutes walk up gentle grassy heathery slopes to the summit trig pillar of the grandiosely named Mount Eagle.